With a particular interest in perception and the spatial experience many of Troika’s work draw inspiration from fundamental scientific, optical and mechanical principles. 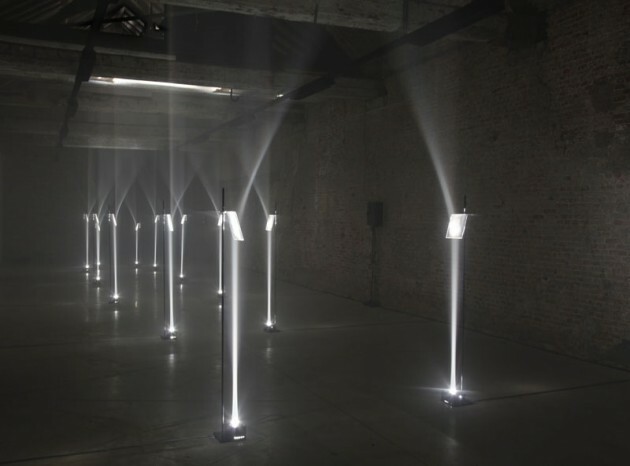 Building on their fascination for optical phenomena, they take inspiration in the work of early enlightenment scientists to create work that is derived from manipulating the very substance of the light itself. An arcade is given shape by a series of 14 pillars of light that are met by fresnel lenses, which refract the light beams and make them bend hyperbolically to form the arches of gothic architecture. By confronting the viewer with the seemingly impossible phenomenon of bending light it creates a space for contemplation and introspection, suggesting a synthesis between agnostic reason and intuitive belief. 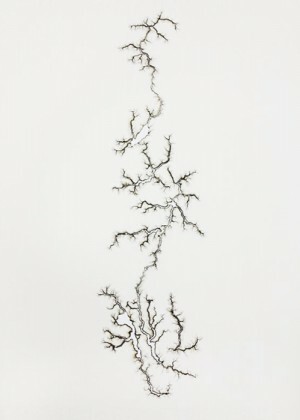 The remains of a powerful electric discharge appear in the shape of intricate repeat-basic forms. By guiding the traces of lightning and manipulating a force to produce the drawings, Light Drawings examine the tension between control over what is inherently uncontrollable, reflecting on what we observe in the small details and in the total pattern of life. 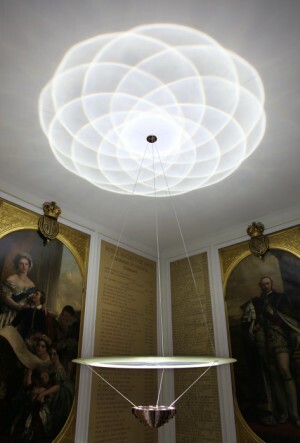 Inspired by the work of early Enlightenment scientists and the manipulation of the very substance of the light itself, the chandelier uses a large fresnel lense to shape the light generated by high power LEDs into geometrical patterns projected onto the ceiling. English poet John Keats commented that science had robbed nature and the rainbow of its spectacle by reducing its notion to prismatic colours. ‘Falling Light’ challenges this belief, with a captivating cinematographic interplay between crystal prisms and the preternatural experience they are able to create. 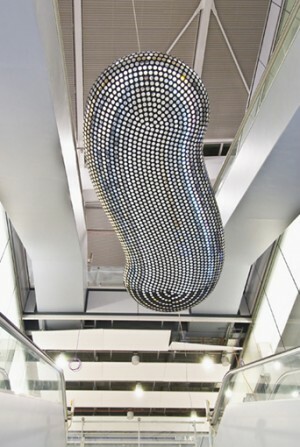 50 ceiling suspended mechanical devices each incorporating a custom cut Swarovski crystal optical lens, a computer programmed motor and a white LED. Small drops of light fall from the ceiling onto the gallery floor, the visitor is immersed in a shower of light, each droplet encircled by a vibrant halo of rainbow colours. 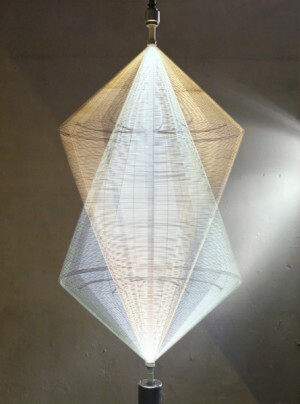 A series of eight illuminated mechanised structures, each of them shaped as a composition of intersecting angular and geometric forms that are made of thin tensed steel banding lined with rows of LEDs. The constructions continuously revolve around their own axis thereby materialising the path of the light and dissolving the spinning structures into compositions of aerial cones, spheres and ribbons of warm and cold light while giving life and shape to an immaterial construct. 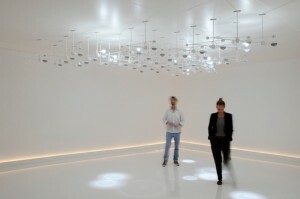 ‘Cloud’ is a five meter long digital sculpture whose surface is covered with 4638 flip-dots that can be individually addressed by a computer to animate the entire skin of the sculpture. 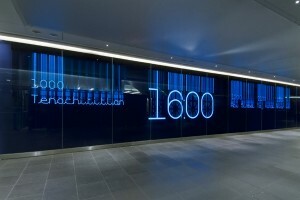 A 22m long electroluminescent wall at Heathrow Terminal 5 – displaying a world clock – created using an custom-made modular text display system. Troika developed and patented a new typology of electroluminescent displays that is less than half a millimeter thin and relies on a custom designed segmented typeface. Posted in Inspiration and tagged lens, light, perception, troika.